We need your support! 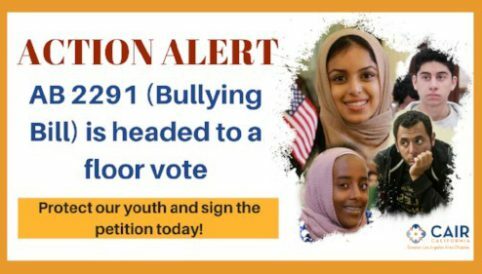 AB 2291 (Bullying Bill) is headed for a vote on the Assembly Floor. Just a few weeks ago, hundreds of you came out for Muslim Day at the Capitol 2018. We’re excited to share that one of the bills we lobbied for — AB 2291 – School Safety: Bullying (Chu) — has made it through the Committee process and is headed to the Assembly Floor for a vote! We’re now calling on our community members to contact their representatives in the State Assembly to ask them to support AB 2291. We need your help to advocate for this important piece of legislation that protects California’s students! 1. Require the California Department of Education to post the online training module along with other available online training to its website. 2. Require public schools to annually provide the online training module to certificated school employees and all employees who frequently interact with students. 3. Require local educational agencies to adopt procedures for preventing acts of bullying. It only takes a matter of seconds to sign a petition and make a difference in our children’s lives!